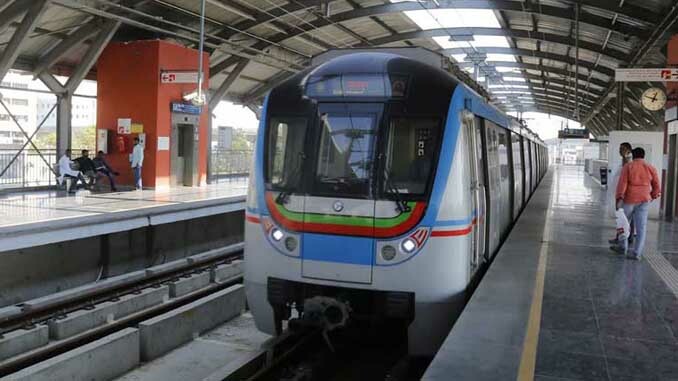 Hyderabad: The Madhapur Metro station on the Ameerpet-Hitech City route will be opened for passengers Today, Hyderabad Metro Rail ltd (HMRL) announced. This leaves only Jubilee Hills checkpost Metro station to be opened on the stretch. The Jubilee Hills checkpost metro station will be open for passenger traffic after the ‘reversal’ work at Hi-Tec City in front of Cyber Towers and Trident Hotel gets completed by May-end, said HMR managing director (MD) N.V.S. Reddy. Initially when the 10-kilometre Ameerpet-Hitech City route was launched on March 20, 3 stations including Jubilee Hills checkpost, Peddamma Gudi and Madhapur were not opened for public. On March 30, the metro authorities opened the Peddamma Gudi Metro station. Currently, trains are being run in twin single line method between Hi-Tec City and Jubilee Hills in the city check-post and are brought to their respective “up” and “down” line directions by making use of the crossover line at the check-post. The frequency of trains on the route is maintained between 9 and 12 minutes, as against 6 minutes frequency on the other corridors.